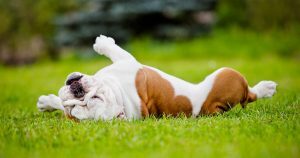 Several studies have shown a link between the use of lawn chemicals and cancer in dogs. The most recent study found the professional application of lawn herbicides and pesticides was associated with a 70% increased risk of canine malignant lymphoma. Canine malignant lymphoma is essentially identical to non-Hodgkin’s lymphoma in humans, and used as a model for the disease in animal studies. For the study, researchers asked the owners of dogs diagnosed with the cancer about their use of fertilizers, weed killers, insect killers, fungus killers and rodent killers. The study found use of these chemicals, in general, increased the risk of malignant lymphoma in dogs, but especially when applied by professionals. That’s probably because lawn care professionals apply the chemicals more frequently and in higher concentrations than homeowners, the researchers speculate. While brands were not specified, herbicides and fertilizers, were the two most commonly applied chemicals. Because it is one of the most popular lawn herbicides, Roundup was almost certainly among them. A California judge recently awarded a school groundskeeper, who claimed glyphosate caused his non-Hodgkin’s lymphoma, $78 million. Now 11,000 more plaintiffs are suing claiming the same. AND… a new study finds glyphosate exposure increases risk of developing non-Hodgkin’s lymphoma by 41%. A 1991 study found that using herbicides containing 2,4-D just four times a year doubled the risk of canine malignant cancer. 2,4-D is similar to glyphosate, except that it focuses only on broad-leafed weeds, while glyphosate is a broad-spectrum weedkiller. A 2013 study found 2,4-D herbicides and other lawn chemicals also increase the risk of canine bladder cancer. Most of us are exposed to herbicides everyday through our non-organic diets, but the risk is heightened for the people actually spraying the chemicals and for pets who frequently roll around in them, the researchers said.